I was seventeen the first time I drove uptown in my mother’s car. It was old. A nineteen sixty-four mint green Rambler with standard steering and brakes. At five foot two and a hundred pounds, I had to throw my whole body against the wheel just to turn the corner. When I got uptown, I remember wondering, “What the hell were they thinking, letting me take the car?” Driving that thing was the equivalent of a chipmunk trying to steer a Tyrannosaurus Rex. “Go that way, dammit,’ I’d squeak. Sometimes the car would obey. My friends and I spent hours in it listening to the radio. When you share the house with six other kids and two parents, you have to be creative in finding your space. My dad would holler through the garage window, “You’re running down the battery!” Sometimes I listened. Sometimes I ran down the battery. Like all cars built then, it was extremely spacious. On family vacations, Linda would sit up front with mom and dad. Joni would lie in the back window. Bill would sit on the floor on some kind of board system, while the rest of us shared the back seat. Any fighting that took place was purely recreational. My first incident with the Rambler happened on the way to Denare Beach. I was stopped by the RCMP for a reason I can’t remember. Probably because I look about ten years old. My friends in the back, each holding a case of beer, wore expressions of such innocence, they might have been preparing for their First Communion. Meanwhile, I had to follow the cop back to his car for questioning. 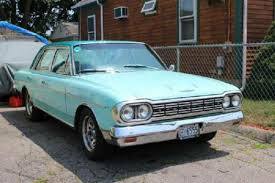 In the next minute, like a slowed down insurance advertisement on what not to do, the Rambler rolled backward and hit the patrol car. It was a gentle roll. I didn’t get charged with anything, just told to fix my parking brake. “My mother’s parking brake, you mean.” I was quick to grant her ownership of the car when it was convenient for me. For the next incident, my grade twelve biology class was on a field trip on the North Star road. After wading through weeds looking for God knows what, we were driving back to class when the Rambler left the road, almost of its own accord. The roll downhill seemed to happen in slow motion. Mud along the shoulder of the road was blamed. But if I hadn’t slammed on the brake, it wouldn’t have happened. We were all fine, except for the Rambler. In spite of its tank like qualities, it was no match for a rocky hillside. Mom, I’m still sorry. The upside is, I became a cautious driver. I always swore that if I struck it rich, I’d buy my mother a brand new car to make up for the loss. It never happened. So, God, its up to you. Give her something for racing around heaven. She was an excellent driver and a very good person. And when we meet again, I’ll probably want to borrow her new car. I think she’ll say yes. This entry was posted in Uncategorized on June 2, 2015 by judithannepettersen.